Magnet building toys are perfect for kids who are still a bit too young for sets that require a bit more dexterity, such as Lego or K’Nex. However, they still allow them to get creative and build their own 3D structures and vehicles, so are great for developing early STEM skills. These kids magnetic building sets are also good precursors to more complex construction kits, like those mentioned above. Read on for our top 4 recommendations for 2018! 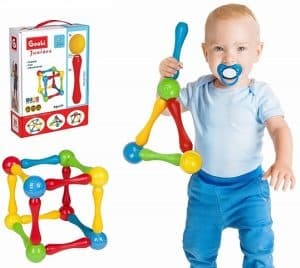 The Goobi Juniors Set features large rods and balls that easily fit together, requiring minimal motor skills to play with. As such, we think this is one of the best magnet toys for toddlers to start developing some basic understanding of engineering. With 40 good size pieces, it’s also pretty good value. Plus they are all bright and colorful – great for keeping toddlers engaged and interested! The only downside is that, due to the size of the pieces, it’s better suited for building large and simple models. This is not a problem if you are looking for a toddlers magnet building toy, but for older kids we would recommend one of the options below. The Picasso Tiles are one of the most popular magnetic building toys for kids. Aimed at a slightly older age group, the components are smaller and allow for more complex shapes and structures to be built than the kit above. 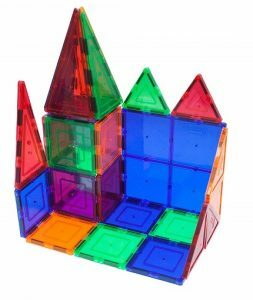 This 60 piece set comes with 5 different building blocks including a large and small square, plus 3 different size triangles. As the magnetic components are solid shapes rather than balls and rods, we think it is better for building house like structures. That said, the Picasso Tiles are pretty diverse in terms of the type of 3D shapes you can build. Through trial and error, kids will have to fit the right pieces together to form geometrical shapes – great for STEM skills. Additionally, there are also tons of sets which are all compatible. So lots of options to expand the learning! 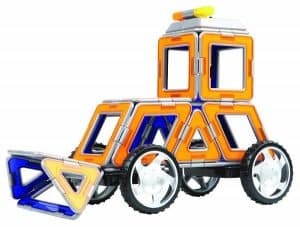 This CMS Magnetics set resembles the classic kids magnetic construction toy that you are probably familiar with. It is essentially the same as the first option featured here, but with much smaller parts. Aside from this being a potential choking hazard, this also means the pieces are more fiddly. Hence why the recommended age is 5+ years! Safety aside, this is a great option for slightly older kids to develop construction and design skills. With the balls and rods kids can build all manner of shapes and objects. However, they will also need to work out how to create a structure that supports the weight of their designs by interlinking all the rods. As such, it can help to develop a basic understanding of architectural engineering. 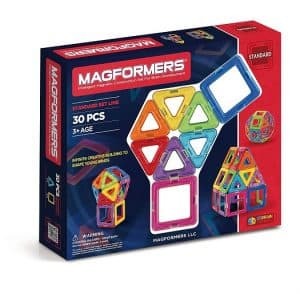 Magformers are probably the most well known kids magnetic building toy maker out there. The design is pretty similar to the Picasso Tiles and is made up of triangles and squares. Although, there isn’t as much variation as with the basic set there is only one size of each. That said, there still endless structures kids can build plus tons of expansions – more on this below. What we especially like about Magformers is the thought that has gone into how the pieces function. The magnets always attract so there is no need to worry about connecting the correct poles! This makes the whole building experience a lot easier and smoother for kids. Additionally, the set comes with a step-by-step guide book full of ideas! 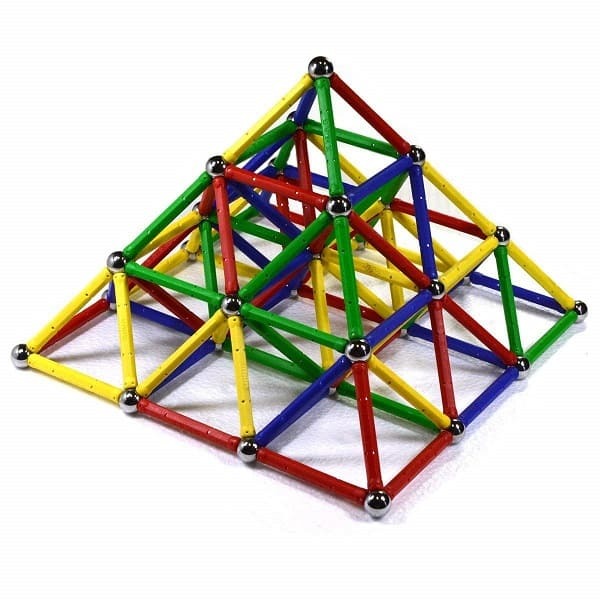 In terms of the overall experience we really think this is the best magnetic building toy for kids on the market. As mentioned above, there are loads of additional sets available to expand the learning experience through introducing moving parts. For example, with the Creator Carnival Set kids can build their own mini functioning Ferris wheel plus several other theme park rides. The XL Double Cruiser (pictured above) is another great expansion for building two awesome vehicles. This includes a digger with functioning scoop! Magnetic construction toys for kids are a simple way for younger learners to develop STEM skills. Since the pieces are easy to fit together and take apart, it’s super easy to experiment with different designs. However, they do have their limits. So if you are in the market for something a bit more complex, check out the list of the best robotics kits.